It was the end of a long day, and I was exhausted and ready for bed. I crawled under the covers, pulled them up to my chin, and let out a long sigh. Our youngest son was five months old, so I breathed in the peace and quiet. No children were crying. No babies needed holding. No diapers needed changing. It was nice. I thought for a minute. My brain fumbled for some sort of context, but nothing came to mind. Earlier that day, my husband had had lunch with a friend from church. During the meal, he confided that I had been less physically affectionate since our son had been born. I had hugged him less, cuddled less, held his hand less willingly. I wasn’t totally withdrawn, but he had noticed a shift, and he wasn’t sure how to handle it. His friend recalled his wife doing the same thing. When their kids were small, her days were full of “touch” from their kids–nursing, rocking, wearing, snuggling–and as a result, she was “touched out” whenever he came home. As I listened, I couldn’t help but notice my body language. I was lying on my back, face toward the ceiling, arms straight at my side. A small plane could have landed in the space between his body and mine. It was like I had positioned myself as far away from him as possible without falling off the bed. I laughed at the chasm between us, and admitted he was right. I was touched out. My reluctance to show affection had nothing to do with my husband, and everything to do with our season of life. Even now, a year later, when my kids are less hands on, I still feel that urge to retreat. There are a lot of days when it’s hard to show physical affection because my body is so over-stimulated. I need down time, away from ALL HUMANS BEINGS, before I can re-engage. That’s why I wanted to share my experience, for all the couples who need words for this struggle. Having this phrase in my communication tool belt has been HUGE. Along those lines, I also wanted to share two bits of advice, one for husbands and one for wives, on how to put this concept to use. For Husbands: Know that this is a thing, and it’s not personal. When your kids are young, your wife’s ability to show physical affection is no measure of her attraction or desire for you. Every cell in her body is crying out for rest, and it has nothing to do with how she feels about you in the grand scheme of things. If this is hard to understand (it’s taken some time for my own husband to grasp), consider the reverse form, which is being “talked out.” For some of you, you come home from work after talking all day, and you just want to sit and not speak. 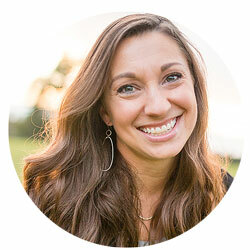 You don’t want to answer a ton of questions, or listen to how your wife’s sister’s friend did that rude thing, because you are verbally exhausted. Same concept. Along those lines, I encourage you to be patient. Give her space. Give her time alone. Take the kids so she can enjoy a long shower, or a nap, or a couple episodes on Netflix. My husband, by the way, has been so great at this. If he is home and he can tell I need rest, he whisks the boys away so that I have several hours to myself. It is AMAZING, and fills me up to care for him in return. For Wives: I hope it’s helpful to have a name for this struggle. It’s easy to get irritated with your husband when you just want to be left alone, so I hope this concept gives you a different perspective. Namely, your husband isn’t the problem. He hasn’t changed. You just have less to give. Knowing this, I encourage you to be generous. Go out of your way to grab his hand, hug extra long, or squeeze up next to him on the couch. When you’re feeling physically exhausted, let him know where you’re coming from, but without getting defensive. Instead of being prickly, tell him you love him and appreciate him. Try to meet him half way–or more than half way–even when you don’t feel like it. Right now, my days are long and physically grueling. When I start to feel trapped, I remind myself this is not my forever, because it’s not. This season will end, and that perspective really helps me. However, I also feel something urgent in that truth. Whatever God intends to teach me through this season, and however He intends to deepen my marriage, I want it. In the past, God has used our frustrations and difficulties to draw me and my husband closer, as well as forging something good and lasting inside me. I know similar treasures are tucked into this season, and I don’t want to miss them. This is so good, Sharon! Thank you! I’m not married yet, but having this piece of information now will likely prove to be helpful in the future. I was just telling my husband yesterday about how anytime I read an article that hits me right on, I always find your name at the bottom. This was helpful to my season of life. Sometimes I end the day thinking, “who am I?” I’m as extroverted as they come, but I find myself fantasizing about being alone or just hiding in my closet. Thank you for your words. Keep doing your thing lady. I hope someday our paths cross. Sara, that is so kind. THANK YOU. I hope so too! Thank you Sharon! I’m not married… yet, but this is going in my Pocket files. I’m an old married lady with five now grown kids, and I remember those touched out days. I birthed 4 children within 4 years and 8 months, so you can imagine. Fun and exciting and exhausting! I think when my husband got home from work and needed touch, or more, it was like one more demand on me that I just didn’t have the strength for. Still, it’s important to communicate that touched-out feeling and explain to one’s husband what they can do to help. Guys need implicit directions, like take care of the kids for an hour so I can reboot, etc. 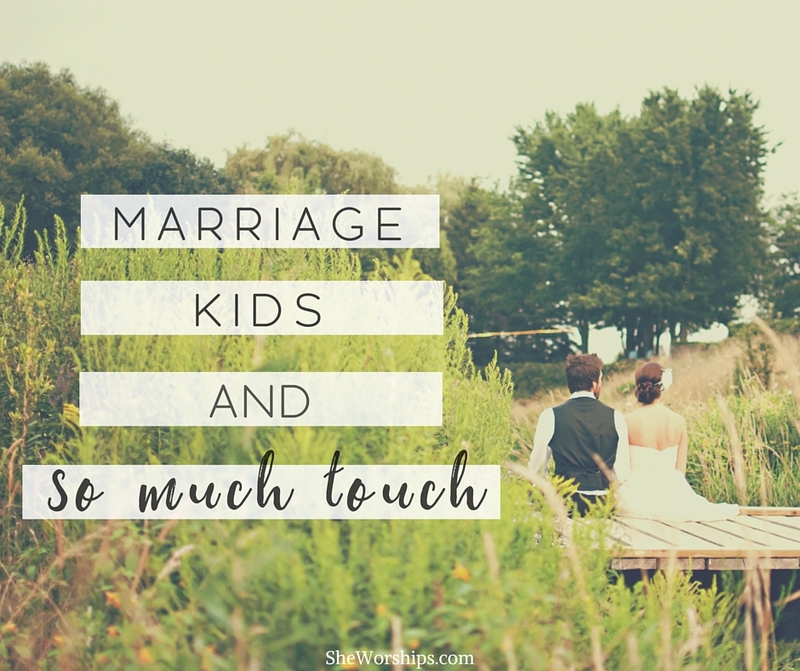 It can save your marriage, because if you wait till the kids are grown to reconnect, it’s much more difficult. I think that’s why some marriages fail after 30 years together. Do what ever it takes to keep it alive, so you have something left when the kids are gone from home. Good advice. It takes a measure of intention, but so worth it. Rosemary, thank you for sharing your own experience! I love hearing from women with more life experience and wisdom to pass down. Oh strained is the word I have been looking for to describe how I feel. And even just that i’m not the only one fantasizing about burrowing into the back of the closet for awhile. I have a 21 month old and a 5 month old, both snuggly little mama’s boys. I love it but…thank you for this! Such good words! I think this concept also affects us moms differently depending on our personality type and our kids as well. For me, I get touched out AND talked out, because my girl is very talkative and very physical. It IS easier now, but in the earlier years, I just wanted to retreat into an introvert bubble when my husband got home. Great thoughts on what to do about this challenge! I had to read this when I saw the title because I get extremely touched out, but with my son, not so much my husband.